The Knightsbridge SK002 13A 2G Mounting Socket is designed to be mounted under cabinet, counter, workshop or corner mounting. The Unit would be ideal for use any modern kitchen, office, utility room or bedroom. Constructed from premium grade stainless steel and beautifully finished brushed chrome effect finish and black inserts. I can now charge my ipad and iphone. I also think it looks pretty cool. I am looking for a desk top socket solution. 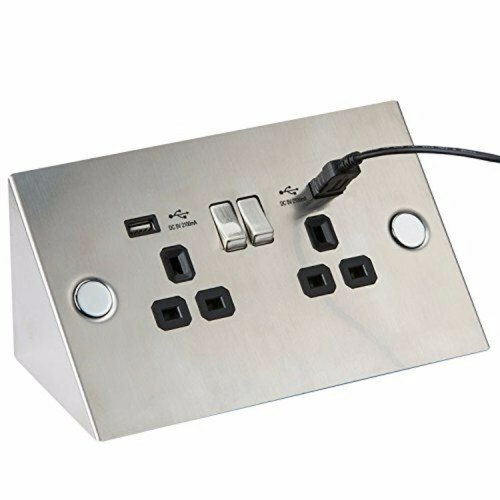 Can two these sockets be mounted on a desk back to back? Do you have a picture of the back of the socket? Does each unit come individually fused? Hi can i ask how will this socket be attached to under a kitchen cabinet ?